A quote from one of my absolute favorite wild edible books, Nature’s Garden by Sam Thayer. 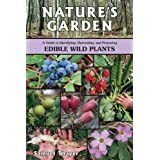 “There is a slight possibility that you could be allergic or intolerant to a plant that is normally edible. Thousands of people are affected by allergies to familiar foods such as peanuts, almonds, mangoes, and cashews…the forager is exposed to new foods on a regular basis…Food allergies are an inescapable and unpredictable fact of life. To use wild foods you must assume this risk. However, such reactions are rare” (30-31).